For the last few months here in Hong Kong, if nothing else, my eyebrows have had a good workout, raising frenziedly with headlines like this leaping out at me from the pages of newspapers (local and international). Admittedly I was a little baffled as to how something so seemingly innocuous like baby food could be the cause of such scandalous headlines. Make no mistake – departing Hong Kong with excessive milk powder is an offence! It seems baby formula has become a powerful and precious commodity. Like gold, copper and oil, it needs to be kept under lock and key with demand for the valuable merchandise desperately outstripping supply. Beware the lurking milk powder thief! Naturally I had to dig a little deeper to see what all the fuss was about. I didn’t have to dig too far because it’s an issue that dates back several years and has generated more than its fair share of headaches, not to mention, mass hysteria and heartache. To cut a long story short, five years ago in China, six babies died and another 300,000 became ill after drinking powdered milk that contained the toxic chemical compound, melamine. Thousands, upon thousands of babies were hospitalized. The substance melamine is used to make plastics and fertilisers and gives a false protein level when added to watered-down milk. The chemical artificially increases the protein-content of milk products, but can also cause kidney failure. Yep! Pretty serious stuff, definitely worthy of some large-scale headlines don’t you think? With 81.6-million children under five years old in China (more than the entire population of France) baby’s milk is big business. 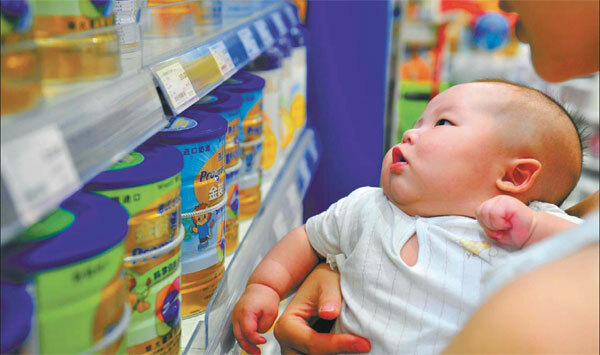 Sales of baby formula in the world’s most populous country grew 29 percent to 95.2 billion yuan ($15.4 billion) last year, more than four times the size of the U.S. market. But the melamine scare left a bitter taste in the mouths of residents, that continues to linger to this day. An ongoing distrust of locally made products means parents are looking elsewhere for their formula fix and going to great lengths to secure safe milk for their babies. In a country with a perceived lax quality control and production shortcuts, it’s about buying a set of regulations and standards they can trust. That means Hong Kong, just a hop, skip and a jump away, is bearing the brunt of anxious parents desperate to buy formula from reputable sources. This mum’s story online highlights the anguish and despair Chinese parents are facing. In an effort to calm the waters, the China Dairy Industry Association says Chinese-made milk powder is better in quality and half the price of imported products. It commissioned a study of formula made in China recently and says results show, regardless of domestic or foreign brand, locally made formula has more nutritional content. But, the spotlight has shone even more brightly on China’s food supply chain this week with reports ‘rat meat’ is being sold in Shanghai as lamb. The Ministry of Public Security announced – if you’ve ordered lamb or mutton for hotpot in Shanghai over the last four years, there’s every chance you’ve been served rat, fox or mink! Two people hired by a county government in Fujian province to destroy pigs killed by infectious diseases have reportedly been detained for allegedly processing the carcasses and selling the meat in neighbouring provinces. The 2008 milk scandal crippled China’s export economy with at least 11 countries stopping all imports of Chinese dairy products. These latest stories only heighten a general sense of anxiety over food security in China. Government reassurances are doing little to stop the influx of Chinese people crossing the border into Hong Kong to buy products and it’s making residents a little hot under the collar. Admittedly the surge in Mainlanders snapping up baby powder has made it difficult at times for Hong Kong parents to buy baby formula for their own children. Shelves across the island have been stripped bare of the precious powder. It’s become such a sensitive issue in the Fragrant Harbor, a petition has even been sent to the White House! Yes THE White House!! An anonymous person started the petition on the White House’s “We the People” section, where any appeal that receives 100,000 signatures within 30 days triggers a response from the Obama administration. It calls for international support and assistance as malnutrition and hunger loom large for the city’s babies. Some say this is verging on being over the top and has embarrassed Hong Kong, particularly when there are countries who’s children are suffering from serious malnutrition and hunger. Maybe so, but the government isn’t taking it lightly. Outbound travelers who disobey Hong Kong’s two can rule face hefty fines – a maximum penalty of HK$500,000 and a possible jail term of two years. But for many, it’s merely a stumbling block not a deterrent. A border checkpoint found several dozen traders with trolleys full of milk powder. They were collecting different brands and handing out cash to travellers willing to take a couple of tins across the border. Since the regulations came into play, a syndicate has been cracked with more than 4000 kilograms of baby formula found in a Hong Kong warehouse worth about a million dollars. It was being stored for parallel goods trading purposes. For border officials in Hong Kong, at the moment, baby formula smugglers are trumping drug smugglers. This year, to date, 879 people have been arrested. Last year, 420 people were arrested for having restricted drugs. Traders are said to travel across the border several times a day with at least two tins of milk powder each time. The formula is then being sold at a premium with Chinese Mainlanders more than willing to pay an exorbitant price for the liquid gold. Hong Kong’s not alone in its restrictions on China, over the past year, stores in Germany, the U.K., Australia and New Zealand have put limits on all bulk purchases of formula. Foreign countries are producing more milk, but say there’s a limit. China’s major milk producer New Zealand was hit by drought in the North Island, dampening production. In the latest bid to appease both Hong Kong residents and Mainlanders, manufacturers and pharmacies have announced joint measures to guarantee Hong Kong mothers six tins of infant milk formula a month, a move they hope will prompt the government to drop its export curbs. An extra 1.1 million cans have been pledged by the Infant and Young Child Nutrition Association (formed by the seven big formula brands) on top of the four million tins usually imported into Hong Kong each month. The association says according to the number of babies born in Hong Kong, the 1.1 million cans per month should be sufficient to feed all local babies. Unfortunately, the formula crisis only fuels the tension between Hong Kong and the Motherland even further. The unrest between the two metropolises likened to a ticking time bomb. So who’s to blame for this disaster? Should governments be doing more on all fronts? What about the dairy industry and milk powder manufacturers, are they responsible? Should the focus be on why standards for infant formula are so different across the globe? What do you think? Is there a formula for success here? ha ha Thanks Steve! I wasn’t sure it would make a great blog topic, but it kept catching my attention and the more I delved into it, the more fascinated I was. But hey, that’s Hong Kong and China for you! Thanks for reading Jemima. Yes I think a lot of countries are starting to worry about their supplies. Hope they can sort out something soon for everyone involved. Crazy. Good story, Nicole. It will be of great interest to Australians travelling to China, as well as Chinese stocking up on tins of baby formula Down Under. Lots of good research as well. Well done! Cancelled my omelette and order the chicken feet instead just to be on the safe side! John Marshall recently posted…A Foreigner in Your Own Country?